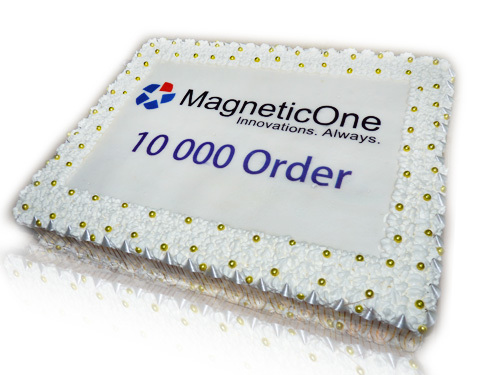 MagneticOne Store Celebrates Its 10000th Order! We are pleased to announce that at www.magneticone.com/store 10000th order was placed! Congratulations goes to Mr. Anthony D. who receives a 50% discount on any our product or service. This event is very important to us because it emphasizes that our store has grown significantly and built up strong relationships with our clients. Ruslan Savchyshyn, the CEO of MagneticOne, greeted MagneticOne team with this remarkable achievement! To celebrate this event, we ordered a huge cake and a lot of sweets that were gone in a few minutes!!! On 19th of September 2010, in Ternopil (Ukraine) the new season of Roborace has started! This time teams from Lviv, Ternopil and Chernivtsi took part in the competition. Each team has shown its own technologic inventions, mostly it were robo-cars. These amazing creations contained some simple intelligence and could move autonomously. Then all the visitors could enjoy the exciting Roborace, where all the robo-cars competed against each other. The team from Lviv (Lvivska Politekhnika) became the winner. Their robot showed the best speed and coordination. Besides the competition everybody could watch the exiting Robo-show accompanied by electronic music. Though the competition is pretty new it already has a lot of fans especially among young people. This competition that has no analogues in Ukraine took place in Ternopil for the second time. MagneticOne that always encourages such events and supports the development of high technologies, has sponsored this show. Besides, Ruslan Savchyshyn, the director of MagneticOne is one of the founder of Robotics Association of Ukraine. This organisation is very young but its plans are huge! In the nearest future it is going to cooperate and exchange experience with other international Robotics organisations. So don’t miss any details about Roborace 2010! Keep up with some news on Roborace at www.roborace.te.ua.